Blueberries prefer a low soil pH between 4.5 and 5.5. Growers add pine bark fines to the soil to reduce soil pH and increase organic matter, but how else can you reduce soil pH? You can add elemental sulfur to the soil before planting, or irrigation water may be acidified. Which is the more effective practice? Researchers at Oregon State University decided to test it out. Researchers compared application of micronized sulfur by chemigation through a drip system to prilled sulfur pre-plant soil incorporation. For the acid injection, the sulfur product was mixed with water and injected weekly for a period of about two months before planting and again for a period of about two months in late summer of the second year after planting. A total rate of 0, 50, 100, and 150 kilograms per hectare ( 0, 45, 89, and 134 lbs/acre) was applied on both occasions. 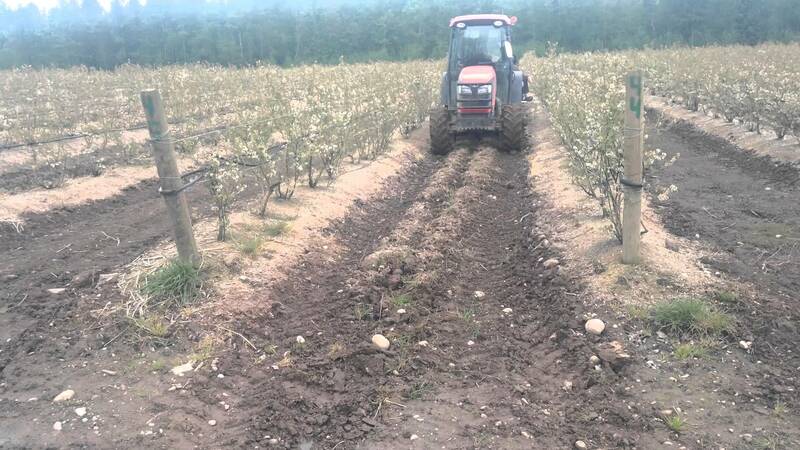 The traditional treatment of soil applied pre-plant sulfur was made in two applications of 750 kg/ha (669 lbs/acre) of sulfur each in July and October. The soil was a silty clay loam with an initial pH of 6.6 with 2.4% organic matter. Beds were raised and mulched with sawdust. None of the treatments had any effect on winter pruning weight in the first year, or on yield, berry weight, or total dry weight of the plants in the second year. Chemigation caused lower concentrations of P, K, Ca, Mg, S, and Mn in the leaves during the first year after planting than soil incorporation . In the second year, chemigation caused lower concentrations of N, P, and S in the leaves. Measurements of soil pH throughout the trial indicated that sulfur chemigation can be used to quickly reduce soil pH after planting, however it was less effective and more time consuming than incorporating prilled sulfur before planting. Chemigation should be a useful practice to correct high pH on already established plantings. Read about How to Calculate Fertigation Injection Rates for Commercial Blueberry Production. For the full article go to HortScience 52(10):1413-1418. 2017. by K.F. Almutairi, R.M.A. Machado, D.R. Bryla, and B.C. Strik. ← Home Remedies for Pest Control – Beware!